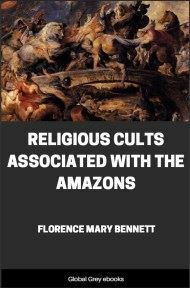 Explores the possible religious beliefs and the legends of the Amazons as well as the goddess cults of ancient Greece and Asia Minor. The author describes in great detail what is known about ancient goddess worship through primary documents. She describes many details that are taken for granted today, such as the double axe symbol, and some aspects that are not so well understood. For instance, some of the male deities of later classical Greek religion turn out to originally be of ambiguous gender. And Aphrodite, who in later mythology is a love goddess, was originally a war goddess. Extensive footnotes. 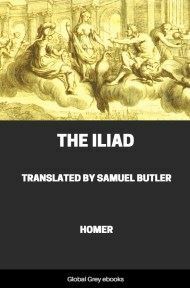 The Iliad contains two direct references to the Amazons:--namely, in the story of Bellerophon and in a passage from the famous teichoscopy. The context to which the first of these belongs is classed by critics as an "echo" from the pre-Homeric saga, and therefore it may be inferred that the Amazon tradition in Greek literature dates from a time even earlier than the Homeric poems. The description of the women here is very slight, being given by the epithet ἀντιανείρας of the line τὸ τρίτον αῦ᾽ κατέπεφνεν Ἀμαζόνας ἀντιανείρας, but, from the facts that battle with them is considered a severe test of the hero's valour and that as warriors they are ranked with the monstrous chimaera, the fierce Solymi, and picked men of Lycia, we gather that they are conceived as beings to be feared. The scene of combat with them is Lycia. The second of the two passages cited above is more definite. Priam, exclaiming on the happy lot of Agamemnon, who has been pointed out to him, says to Helen: "Oh, happy Atreïd, fate's child, blessed with prosperity! 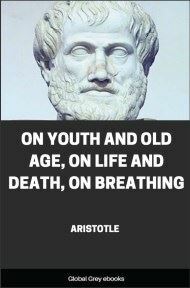 Verily, to thee are many subject, youths of the Achaeans! Once did I go to vine-rich Phrygia, where I beheld vast numbers of Phrygian men with swift-moving steeds, the people of Otreus and godlike Mygdon, who were then encamped by the banks of the Sangarius. For I was numbered an ally with these on that day when the Amazons came, pitted against men. Yet even these were not as many as are the quick-glancing Achaeans." Although the characterisation is the same as in the Bellerophon story (Ἀμαζόνες ἀντιάνειραι), there is gain in that the impression of the Amazons as a mighty band of warriors is strengthened, also that the event has its place in the conventional chronology of Greek legend, antedating the Trojan War. It is to be noted, moreover, that here the Amazons are the aggressors on the confines of Phrygia. There is another allusion in Homer to the Amazons, although this is indirect rather than direct. It occurs in the second book of the Iliad, where the spot of assembly for the Trojans and their allies is designated: "There is before the city a certain lofty barrow, in the plain far away, standing detached on this side and on that, which men, forsooth, call Batieia, but the immortals name it the grave of swift-bounding Myrina. Here then were the Trojans numbered and their allies." The scholiast and the commentary of Eustatius on the passage tell that this Myrina was an Amazon, the daughter of Teucer and the wife of Dardanus, and that from her the city Myrina in Aeolis was said to have been named. It seems reasonable to suppose that the commentators are correct, for in later literature we hear much of an Amazon by this name, and there is frequent mention of graves of various Amazons, here and there in Greek lands, always regarded with wonder and awe akin to the reverence with which Homer mentions the tomb of Myrina. 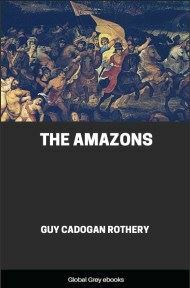 The Amazons then, as they appear in the Homeric poems, are a horde of warrior women who strive against men, and with whom conflict is dangerous even to the bravest of heroes. They belong to Asia Minor, seemingly at home in the neighbourhood of Lycia and opponents of the Phrygians on the river Sangarius About the grave of one of their number there lurks a hint of the supernatural. The poet does not say whether she was friend or foe of Troy. On the analogy of similar graves pointed out in various parts of Greece, she who lay buried there may well have been a foe, yet later Greek commentators saw in this one an ancestress of the royal line of Troy. In this they may have drawn on the Aethiopis, which tells of an alliance between Amazons and Trojans. 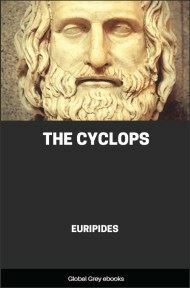 We pass thus from the Homeric Epic to the Epic Cycle. Proclus in the Χρηστομάθεια Γραμματική, whence Photius quotes excerpts, says that the last book of the Iliad was followed by the Aethiopis in five books, written by Arctinus of Miletus (circa 750 B.C.). He starts the argument thus: "The Amazon Penthesilea, daughter of Ares, a Thracian by birth, appears to give aid to the Trojans. In the pride of her valour Achilles slays her, and the Trojans bury her. Achilles destroys Thersites for speaking slander against him and carping at his alleged love for Penthesilea; whence there is a division among the Greeks in regard to the murder of Thersites." It is not possible to trace the story of Penthesilea beyond the date of the Aethiopis. How much the poet made of the romantic situation drily described by Proclus, it cannot be determined, for the evidence has perished with the work. Certainly it did not lose in pathetic details at the bands of the writers and painters of later years. The outline preserved by Proclus speaks only of the "alleged love" of Achilles for the queen, yet that affords a starting-point for the play of much romantic fancy in subsequent times. The fact that in the Aethiopis Penthesilea is called a Thracian raises the question whether the author does this lightly, or whether he has serious thought of Thrace as the home of the race and of Ares as their patron deity. Diodorus gives Ares as the father of Penthesilea and Otrere as her mother, and St. Basil adds that she was queen of the Amazons of Alope in Pontus, but elsewhere Otrere too is called a daughter of Ares, her mother being Harmonia, while her children are Hippolyta and Penthesilea. Ares, however, is quite steadily named by Greek writers as the father of the Amazons in general, and Harmonia, as their mother.